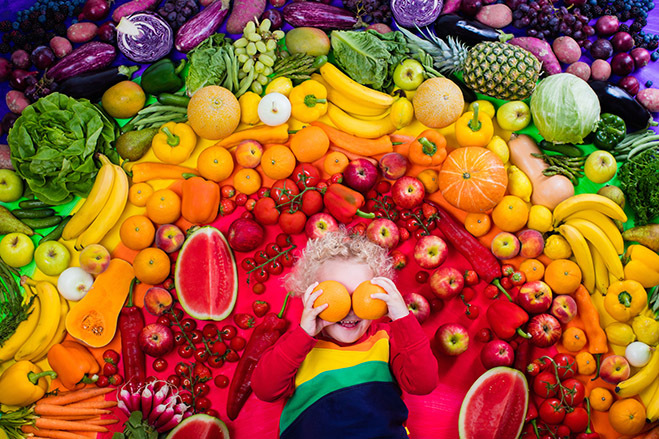 Although we are partial to purple at Superberries, eating fruits and vegetables that are other colors of the rainbow provides important nutrients with powerful health benefits. Not to mention, brightly colored fruits and veggies provide everything your body needs. Superberries products feature the top antioxidant, the purple Aroniaberry. Purple – Beautiful to look at and delicious to eat, blue and purple fruits and vegetables are rich in polyphenols, anthocyanins, proanthocyanidins, and resveratrol. These antioxidants have been found to have prevent heart disease; lower blood pressure; may have cancer fighting benefits and can also boost your memory. These fruits and veggies may also contain vitamin C (immune system), A (eyes and brain), potassium and zinc. Eat berries like the aroniaberries, purple cabbage, eggplant and plums to get this nutrition. Green – Green fruits and vegetables are refreshing to eat. Eat green veggies to detox, for energy and to restore vitality. Green produce is rich in vitamin K (blood and bone health), lutein (eye health), isothiocyanates (detox), isoflavones (age-related diseases and loss of cognitive function). Green vegetables are may also be rich in folate which is essential for pregnant women. Eat broccoli, zucchini, spinach or kiwi to get greens in your diet. Red – These fruits and vegetables are luscious and contain antioxidants such as vitamin A (beta carotene), vitamin C, manganese, and fiber, all so good for your heart. Plus, red apples have quercetin, a compound that supports your immune system. Other benefits of these vibrant fruits and veggies is their ability to fight cancer, reduce the risk of diabetes and improve skin health. Eat tomatoes, strawberries, watermelons, and raspberries for these benefits. White – White and brown fruits and veggies keep bones strong, may have cancer protective effect and keep your heart healthy. White produce contains a compound called allicin and quercetin that protects against atherosclerosis and heart disease, lowers cholesterol and has an antibacterial effect. Vegetables in this color category also may contain vitamin C, vitamin K, folate, and fiber. Eat bananas, cauliflower, garlic, and potatoes to get these import nutrients in your diet. Yellow & Orange – These fruits and veggies are known to improve immune function, support eye and heart health. They are loaded with vitamin C especially the citrus fruits— and some, such as carrots, with vitamin A (beta-carotene) which helps with eyesight. They also contain manganese, potassium, vitamin A, fiber, and magnesium. potassium, and vitamin B6 for general health support. Eat carrots, sweet potatoes, cantaloupes, oranges, peaches, yellow and orange peppers to get the benefits of these colorful fruits and veggies. Here's an infographic that explains it all.